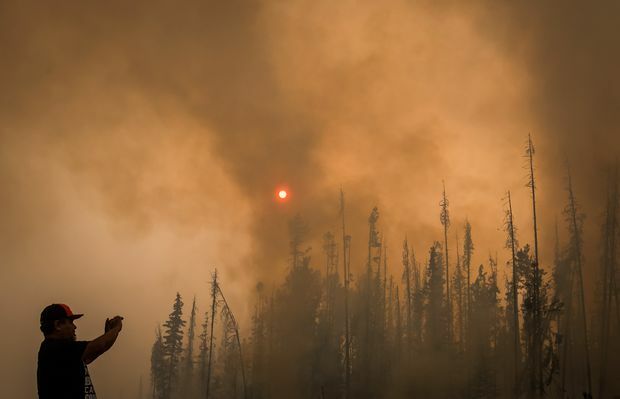 World In wildfire-prone B.C. and California, urban sprawl and bad planning are fuelling future infernos. What can we do? In wildfire-prone B.C. and California, urban sprawl and bad planning are fuelling future infernos. What can we do? Aug. 22, 2018: Images from the Deimos-1 satellite show large smoke plumes over B.C. as hundreds of wildfires continue to burn across the province. The red areas indicate vegetation. Hundreds of wildfires are raging across Western Canada and the United States, sending residents fleeing from their homes as firefighters risk their lives to contain the infernos. Such scenes have become increasingly familiar as wildfires have gotten more frequent and fire seasons once concentrated in summer now stretch into spring and fall. Climate change bears much of the blame for longer, drier and more lightning-prone fire seasons. But other aspects are under more immediate human control: Decades of forest-management policies that called for extinguishing naturally occurring fires as quickly as possible have made forests denser and more susceptible to major blazes. At the same time, urban sprawl is pushing housing development farther into the wilderness. Scientists largely agree that climate change is helping to make wildfires bigger and more frequent. Rising temperatures have caused 4.2 million hectares of forest to burn across the United States between 1984 and 2015, according to researchers from Columbia University. Spring comes sooner and vegetation begins to regrow earlier, setting the stage for early-season fires. Earlier springs mean water sources dry up quickly and vegetation dries out earlier in the year, particularly in arid regions such as California. Per cent change in burnt area in Western U.S.
Fire season length in Western U.S. There is also evidence that climate change is making lightning strikes, which are frequent causes of wildfire, more common. In a 2014 study published in the journal Science, researchers at the University of California, Berkeley, estimate that lightning strikes could increase in number by 50 per cent throughout the 21st century. Warmer temperatures will cause disturbances in the atmosphere that allow air to rise quickly, a central component in creating an environment for more thunderstorms. Some scientists believe climate change is exacerbating existing cycles of droughts in California, putting the state at high risk of wildfires. Nearly 130 million trees died in California during a six-year drought that ended in 2017, coinciding with the state’s deadliest fire season in history. In B.C., experts attribute a mountain pine beetle epidemic partly to milder winters from climate change, since the beetles require a long, deep freeze to be eradicated. The beetles have killed millions of lodge pole pines, weakening the forests and leading to a buildup of dead trees that are more susceptible to fire. While climate change is exacerbating existing environmental trends in the West, humans also have a lot to do with why fires are getting worse. Researchers from the University of Colorado estimate that humans were responsible for starting 84 per cent of the blazes over the past 20 years. While most fires caused by lightning tend to happen in the summer, fires started by vehicles, logging equipment, campfires, fireworks, downed power lines and burning trash have all helped to extend the fire season by three months. Lightning strikes cause a larger share of fires in British Columbia, which has a far smaller population than California. 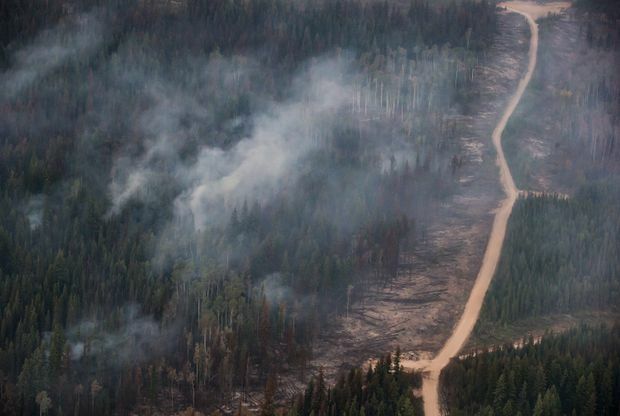 But humans were still responsible for 59 per cent of wildfires in the province since 1990, while forestry equipment from the provinces logging industry was responsible for roughly 4 per cent of fires. For more than 70 years, the U.S. Forest Service has used cartoon mascot Smokey the Bear and his catchphrase "only you can prevent forest fires" to encourage fire prevention. For decades, standard practice in the United States and Canada was to put out all fires in public forests as quickly as possible to protect communities and resource industries. 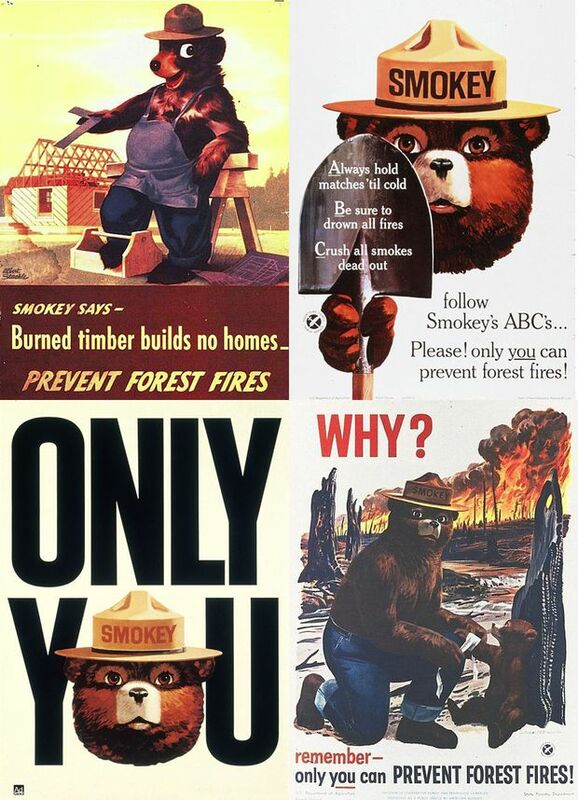 Researchers sometimes refer to fire suppression as a “Smokey Bear policy,” after a cartoon mascot dressed as a forest ranger that appeared in PSAs. But over time, scientists have begun to understand how important regular fires are for the forest ecosystem and how government efforts to prevent burning had actually made forests more susceptible to larger, more dangerous fires. Before European settlers arrived in North America, scientists believe, fires burned through Western forests every two to 15 years, clearing out small seedlings and dead plants, while opening up the forests and preserving more fire-resistant mature trees. When the regular fire cycle was stopped, forests became denser and dryer, as plants were forced to compete with each other for water. Fire-suppression policies also helped invasive species, such as the highly flammable cheatgrass in California, to take hold. The Invasive Species Council of B.C. believes the long-standing fire suppression policies contributed to the province’s mountain pine beetle infestation, since the beetles prefer older trees and are typically killed by either a long, deep freeze or by fire. Earlier this year, an independent review commissioned by the B.C. government to study last year’s devastating wildfire season found that in years when forestry officials actively promoted prescribed burns – fires that are purposely set to thin out forests – wildfires in future years were less severe. Arguably the most significant cause of the rising number of devastating wildfires has been urban development that has pushed new housing farther into fire-prone natural areas. Researchers warn that cities continue to sprawl outward into the wildland-urban interface, the area where human development meets fire-prone forests and grasslands. The result is that “communities [are] at risk from fire in ways that have not been true for a century in the U.S.,” writes Arizona State University fire historian Stephen Pyne. expands further into the wilderness. slides that killed 21 people in January. The areas where houses and wilderness meet. sprawl expands further into the wilderness. Researchers with the University of Wisconsin-Madison estimate that nearly 12 million new homes were built in the wildland-urban interface across the United States between 1990 and 2010. During the same time, the number of buildings burned in wildfires has more than tripled. Similarly, Canadian Forest Service fire scientist Lynn Johnston estimates that roughly 60 per cent of municipalities and First Nations reserves in Canada have been built within 5 kilometres of large fire-prone areas. Experts believe those development pressures will only continue to grow as local municipalities permit more development in fire-prone areas to solve affordable housing shortages and boost property tax revenue. That’s particularly true in California, home to nearly 40 million people, where home prices are among the highest in the country. Residents are often anxious to return home and municipalities are keen to rebuild their decimated property tax base, giving local governments an incentive to green-light new development quickly. The result is that development in areas at high risk of fire sometimes actually picks up pace after a major blaze has swept through the community. Researchers with the University of Wisconsin-Madison studied Google Earth satellite images of more than 3,600 homes that were destroyed in wildfires across the United States between 2000 and 2005, a period that coincided with the country’s housing boom. Five years after the blazes, just half the homes had been rebuilt. But in many cases, developers had launched their own building sprees on fire-scorched land. Thanks to the spate of new home building, there were nearly 20 per cent more homes built in areas destroyed by fire than had existed before the blaze. Oct. 9, 2017: A firefighter walks near a burning house in Santa Rosa, Calif., a wine-country community that was devastated by nearly identical fires in 2017 and 1964. Aug. 9, 2018: A burned tree sits beside Cheri Sharp's new home under construction in Santa Rosa, Calif. Ms. Sharp's house was destroyed in the wildfires last October, and had to dip into her retirement savings to rebuild it after she discovered her insurance didn't cover it. One community devastated by last year’s deadly blazes offers a prime example of why it can be so hard for local governments to say no to development, even in areas with a documented history of fire. Nestled in the hilly Sonoma County in California’s wine country, the city of Santa Rosa has seen two virtually identical fires sweep through its community in half a century. The Hanley fire that broke out in 1964 destroyed 108 homes, but killed no one. 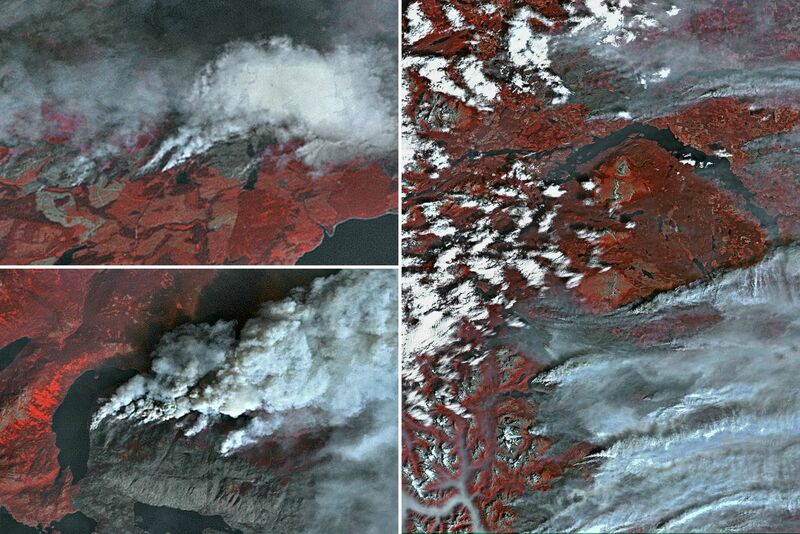 Last October, almost exactly 53 years later, another blaze followed a nearly identical path. Only this time, what was once a sparsely populated neighbourhood in 1964 was now one of Santa Rosa’s most exclusive subdivisions. The Tubbs fire that tore through Santa Rosa last October destroyed nearly 2,000 homes and killed more than 20 people. fire twice in the past 50 years. Less than a year later, city officials have issued permits to rebuild nearly 650 homes and expect it will take three years to rebuild all 3,000 properties destroyed in the blaze. Rather than make building requirements stronger after the fire, officials have waived fees and allowed homeowners to bypass some of the usual development permit procedures. As with many cities in California, Santa Rosa is facing a severe housing crisis that has only been made worse by the fire. A year before the blaze, city officials set an ambitious goal of building 5,000 new homes in the community of 175,000. Now, officials are scrambling to add an extra 3,000 new homes to that mix. As it rushes to help residents rebuild, Santa Rosa is also pushing to create even more new housing in regions scorched by the fire. This year, the city council voted to rezone an undeveloped 40-acre plot of land in the burn area to allow a local developer to build up to 237 townhouses. Supporters said the project, which would include affordable housing units, was critical to the city’s economic future. But at least one local official is worried about green-lighting new development in an area that has burned twice in the past 50 years. “I’m concerned that we are not showing that we’ve learned from the fire,” said Julie Combs, the lone city councillor to vote against the proposal. Aug. 23, 2018: A fire break is seen in an area where a controlled burn was conducted to keep the Shovel Lake fire from reaching the Nadleh Whut'en First Nation in Fort Fraser, B.C. Forestry officials are coming around to the idea of using controlled burns in cooler, wetter weather to prevent out-of-control fires in the dry season. Experts now believe that existing policies to prevent forest fires and control development in the wilderness haven’t lessened the risks of wildfire. But many of the proposed solutions face major political hurdles. Rather than putting out most wildfires as quickly as possible, forestry officials are coming around to the idea of letting lightning-strike fires burn out naturally, and of starting controlled fires during cooler and wetter weather in hopes of clearing forests of the kind of dense debris that has caused recent wildfires to burn out of control. But governments have struggled to expand prescribed burns. Thinning out vast tracts of forests can be expensive. B.C.’s auditor-general estimated this year that it would cost the province $6.7-billion to treat all the areas at high risk of wildfires. Governments also face pushback from residents who worry about the health and environmental effects of skies filled with smoke and the possibility of prescribed fires burning out of control. The B.C. government’s independent review of last year’s fire season recommended the province offer legal protections to agencies that conduct prescribed burns. 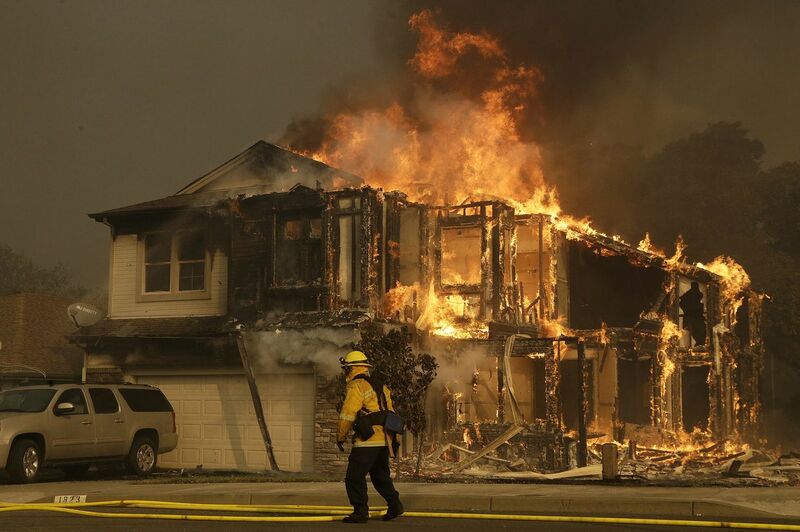 Increasingly, fire investigators have called on states and provinces to revise building codes to require new homes in high-risk fire zones to be constructed with fire-resistant materials such as tempered double-pane windows, asphalt roofs and sprinklers. In B.C., it remains up to local municipalities to mandate additional safeguards. While some communities have made building in fire zones more onerous, the laws aren’t uniform across the province. At the same time, stricter building codes alone aren’t always enough to stop homes from burning. California overhauled its building code in 2008 to require more fire-resistant materials and home designs, changes that added an extra $3,000 to the average cost of home construction. But of 22 homes built in Santa Rosa’s fire zone after the new standards came into practice, just one survived the blaze. Some experts have called on governments to adopt some of the similar policies put in place to protect against floods and landslides, including banning development in dangerous areas. Few have adopted the idea. Of 65 communities across B.C. and Alberta surveyed by University of Alberta researchers in 2013 that had grappled with wildfires, just seven had enacted rules prohibiting development in dangerous fire zones. Scenes of devastation after 2016's fire in Fort McMurray. Researchers from the Institute for Catastrophic Loss Reduction found small differences in landscaping often made the difference between homes that burned and others that survived. Others believe the greatest promise lies in educating individual homeowners to protect themselves. Last year, researchers from the Institute for Catastrophic Loss Reduction toured the homes destroyed in Fort McMurray’s 2016 wildfires to figure out why some homes had burned while others survived. 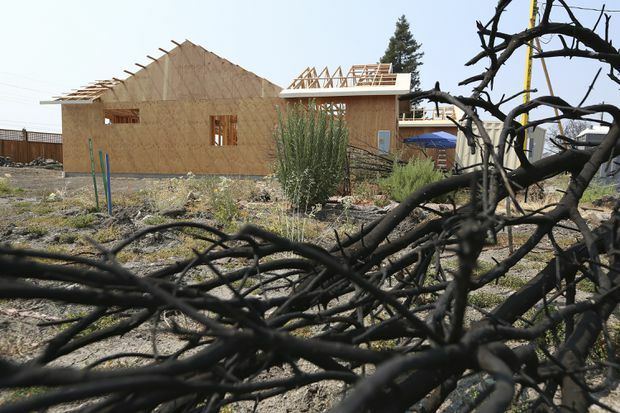 They found the differences often came down to small factors such as landscaping that included highly flammable juniper and cedar shrubs, flowerbeds lined with wood mulch and yards cluttered with ATVs, boats and firewood. When the institute’s researchers travelled to Kelowna to examine rebuilding six years after the city’s 2003 wildfire, they found many of the same problems, including highly flammable landscaping materials, prompting a warning that many of the rebuilt homes were “now at extreme risk of igniting” once again. Without dramatic action from governments, the researcher say, encouraging homeowners to prepare for wildfire may be the best shot at stemming the rising cycle of fires in the West. Aug. 15, 2018: Verne Tom photographs a wildfire burning along a logging road southwest of Fort St. James, B.C.